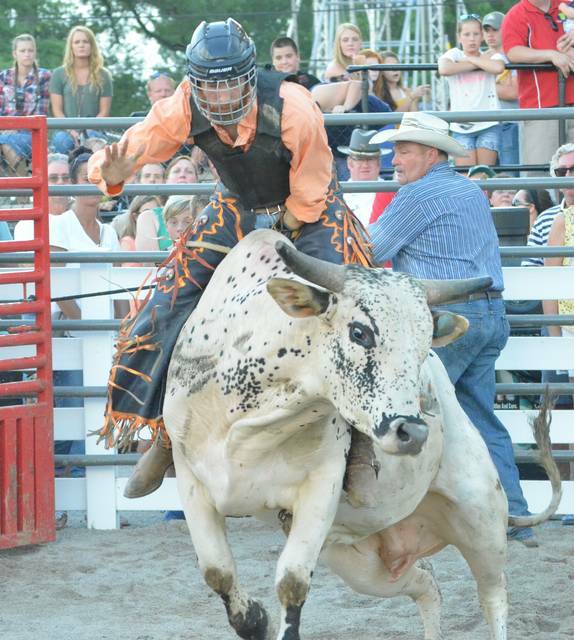 Bull rider Jesse James, of Celina, begins his ride on a bull named Twister Friday during the Auglaize County Fair bull riding competition at the grandstand. “The second I hear that buzzer my next thought is ‘How do I get off?’ It’s a lot trickier than it looks,” James said after completing his 8-second ride. Cody West, of Markleville, Indiana, holds on as his bull bolts out of the gate during the bull riding competition at the Auglaize County Fair grandstand Friday. West said after his ride is finished his only thought is getting up and getting to the fence safely. See more photos from the bullriding event. 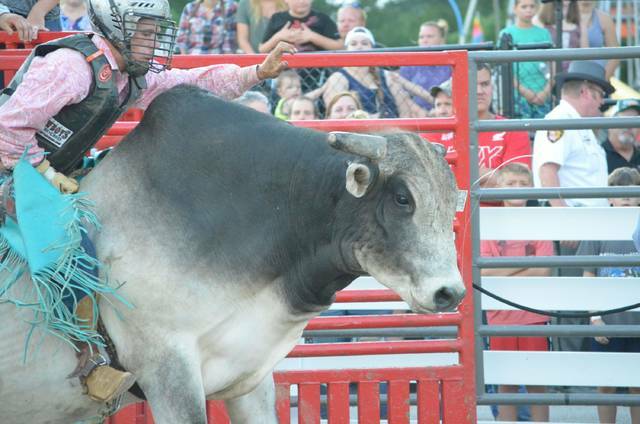 WAPAKONETA — The bull riders performing at the Auglaize County Fair Friday have different physical preparations they make before easing onto the two-ton animals, including stretching, tightening ropes and knotting their hand down. But what exactly is going through their minds in those last few moments before that gate swings open and the massive animals start bucking? Borntrager has been bull riding for four years. He got into it because he liked the culture and the adrenaline rush looked like fun, he said. Bailey Poling, of Convoy, said he lives right down the road from Hat Creek Arena in Van Wert and used to watch the bull riders there. Around three years ago he decided to give it a try, he said. Many of the riders participating in the Auglaize County Fair event go to the Hat Creek Arena so he’s become friends with them. After they’ve finished rides they give each other pointers on how to improve the next ride, Poling said. “I scoot up on my rope, clear my head, knot it and go,” said Jesse James, of Celina. Bull fighters have to take the animals head on. Johnson said bull fighters are studying the bull for those few moments before the gate opens. They’re looking to see which bull it is, but this time in the season they’ve gotten to know the individual personalities, he said. They know how aggressive they’ll have to be in distracting the bulls from the riders depending on how aggressive the animals are.